Just as Mr. Poopybutthole foretold, it’s been a year and a half or longer since we’ve seen a new episode of Rick And Morty. Last summer, optimistic reports emerged that Adult Swim’s flagship animated series would be back before the end of the year, but that projected return date came and went, like a Meeseeks exploding into nothingness after serving its purpose. 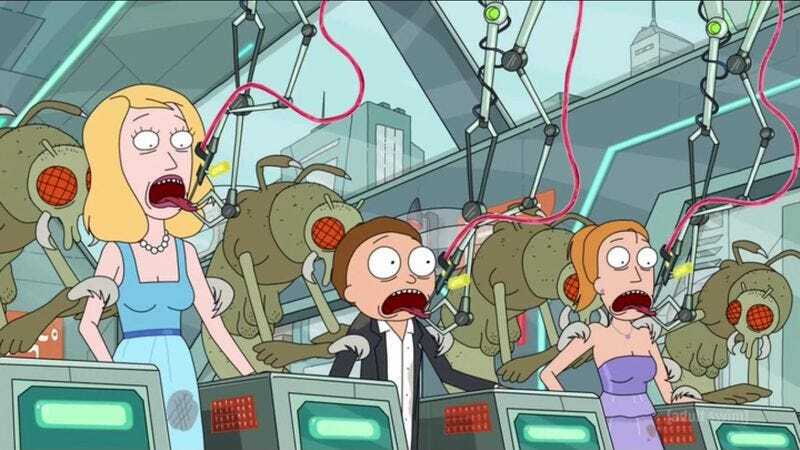 Season three still doesn’t have a premiere date, and co-creator Dan Harmon has shouldered much of the blame for the delay, citing an especially slow writing process with fellow mastermind Justin Roiland. Until further notice, we’re still hanging from the cliff the two erected at the end of season two, way back in the simpler days of October 2015. Those who need a refresher on the events of that season finale can find one in a new interactive website Adult Swim has launched, which joins a growing list of bonus content for restless Rick And Morty fans, including some animatics, a retro video-game version of the title sequence, a series of Claymation shorts, and even a hilarious reenactment of an insane court transcript. Season two ended (year-and-a-half-or-longer spoiler alert) with Rick hauled off to space prison, while the Earth was forcefully inducted into the Galactic Federation, which has turned the planet into an alien tourist destination and intergalactic hub. The website offers a window into the new status quo with a list of “services” the Federation provides (like Complimentary Monitoring and Familial Liquidation) and the ability to browse a database of prisoners. The main draw, though, is a website within the website—a kind of Buzzfeed parody designed around the collision of Earth and alien culture. There are life hacks (How To Catch All Of Earth’s Hottest Diseases), clickbait listicles (Eight Things Only 750-Million-Year-Old Cosmic Entities Will Remember), and inspirational videos of slimy space creatures adopting a litter of kittens (actually vicious rats). It’s a bit like our sister site, ClickHole, but crossed with the improvised lunacy of the show’s two channel-surfing episodes. It should take fans at least a good half hour to browse through all of that original material. They’re on their own as to how to fill the rest of the indefinite “and longer” separating them from new Rick And Morty episodes. Might we humbly suggest boning up on your plumbus-making skills?